The latest New Hampshire Journal poll finds that most Granite State voters believe the pain caused by the government shutdown outweighs the potential benefit of President Trump’s border wall. 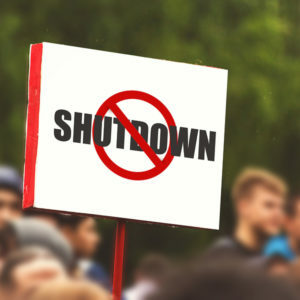 When asked, “Do you believe the government shut down is worth the cost to government workers if it results in significant funding for a border barrier?,” 57.6 percent of New Hampshire registered voters said funding a border barrier was not worth the cost of the shutdown, while 35.8 percent said it was. Another 6.6 percent were not sure. The partisan divide on the shutdown vs. border question is wide, with 93 percent of Democrats saying no and 83 percent of Republicans supporting President Trump’s position. Unaffiliated voters, the largest group in the state, believe the shutdown isn’t worth the cost by a 65 to 23 percent margin. Young Granite State voters were the least supportive of the shutdown as an acceptable price for a border barrier, with just 25 percent of 18-30 year olds in favor and 69 percent opposed. This is not good news for a GOP already struggling to attract Millennial and Gen Z voters. “New Hampshire may be a purple state, but voters here are solidly against President Trump’s government-shutdown strategy. Such a wide gap in support from a state the president nearly carried just two years ago is not good news for the president or his agenda,” said Shawn McCoy, a former GOP campaign strategist who now serves as publisher of New Hampshire Journal. Additional results from the latest NHJournal poll, including the president’s approval rating and results of head-to-head match-ups with potential Democrats, will be released soon. The poll was conducted for NHJournal by Praecones Analytica between January 16-21. Survey results are based on a statewide sample of 593 registered voters in New Hampshire. Responses were gathered using both interactive voice response (IVR) landline calls as well as online surveys. The margin of error for the entire sample is +/- 4.0%.